With just ten days before this year’s Parklife Festivals kick off in the Queensland capital Brisbane, organisers have unveiled the official festival app! 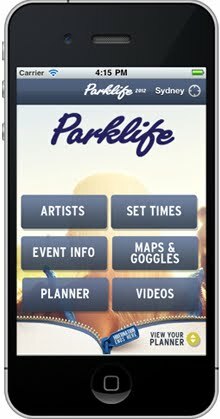 Containing everything you need to know about the artists who are playing, the set times, event information, a planner, maps and more, the app has been made available for both iPhone and Android. Set times for each city have also been unveiled over at the PARKLIFE WEBSITE, along with further information and maps. The 2012 edition of the festival is headlined by the likes of The Presets, Robyn and Justice. No, we’ve heard nothing about Robyn sideshows this time around. A crying shame! Do you guys know anything about a Robyn sideshow? Nothing has been announced and you’d think she would have done one considering I’ve seen so many people asking for one.